First published in 1971, this work examines the tradition of the epic and the many forms in which it has presented itself over time. After unpicking the defining aspects of an epic, the book tracks the literary tradition from the classical period through to modern day. Exploring major texts such as Beowulf, Odyssey, Divina Comedia, The Faerie Queene and Ulysses, this work will be a valuable resource for those studying the epic and English literature. 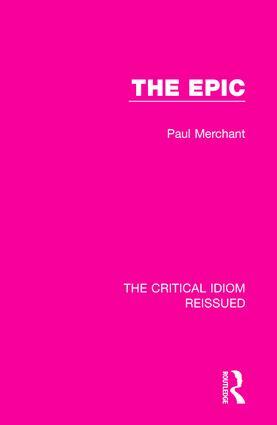 This set of 37 volumes is a revival of the original Critical Idiom series. First published between 1969 and 1979, the volumes in this series provide concise and accessible introductions to a range of critical terms which are key to the study of literature. This set will be a valuable resource for students working with complex literary terminology.